As data-driven cultures continue to develop and data-driven organizations garner larger segments of the market, executives are looking at the best practices of those companies to see how they can replicate their results. One key component of a data-driven organization is the implementation of selfservice analytics environments that enable business analysts and decision makers to explore and analyze data at a faster pace than ever before. 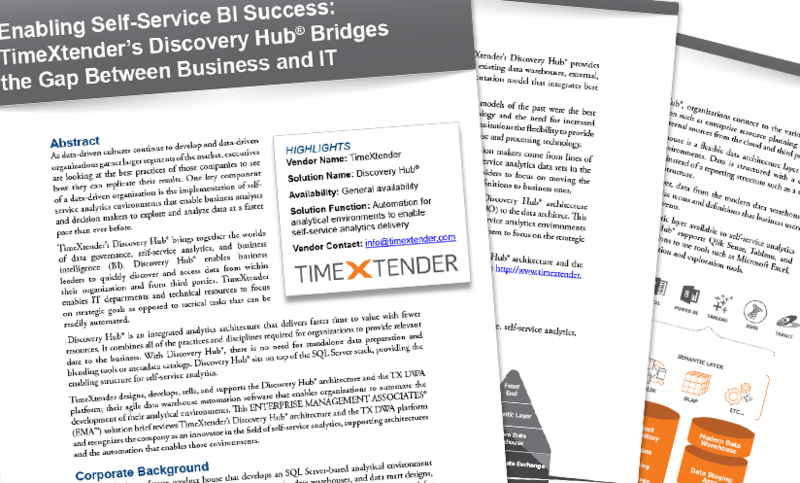 TimeXtender’s Discovery Hub® brings together the worlds of data governance, self-service analytics, and business intelligence (BI). Discovery Hub® enables business leaders to quickly discover and access data from within their organization and from third parties. TimeXtender enables IT departments and technical resources to focus on strategic goals as opposed to tactical tasks that can be readily automated. Read more about TimeXtender's Discovery Hub® here.